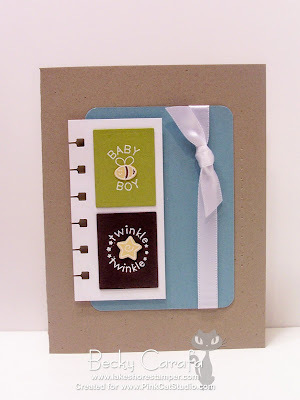 I've used this layout before, but it is one of my faves when making baby cards. This is the last one I made for the Sweet Pea release. Thanks for stopping by! My counter went over 100,000 over the weekend, wow! Look for blog candy soon. sweet card becky!!! I can't imagine NOT having someone do my taxes...woot woot for already receiving your funds!!! Very cute. Love the blue and brown together. we do the same wit our taxes. It's nice to not have to worry about it. LOVE the card. The layout is great! Thansk again for all your cheerleading today! Great job Becky- this is cute, has awesome colors and is your signature style!! So sweet! Love the LO and colors! That's a great card! I like how you did your layout and the way you stamped your images! Oh I adore the kraft and the color blocking you did on this card! And the white stamping is beautiful! Such a stunning and clean card!